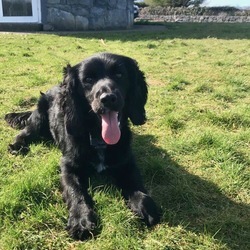 ******FOUND******** Lost in Burren, North Clare area this afternoon (28th Jul) Black male cockapoo (looks like cocker spaniel) Rocky, microchipped & neutered, 1 and half yrs old. Has red Persafe electric collar on. Any info please contact Aideen 087 8116006.